Once more UNESCO passed an anti-Israel resolution today, rejecting Israeli sovereignty and calling it an occupying power in Jerusalem. But you know what... as angry and annoyed as we might feel, this vote doesn't really make a difference, because Jerusalem has been the capital of the Jewish world for so so long, so much longer than any of the countries that voted against us today. For over 3000 years since King David first proclaimed it as our capital, it has never left our hearts. It has never left our minds. It has never left our prayers. It is so ingrained in us as a people that no force on earth will be able to change that - least of all an insignificant organisation dominated by Arab dictatorships and human rights violators who contribute nothing to the world, but continued fanaticism. I was there earlier this year, walking the streets of the Old City, feeling its smooth limestone under my fingertips. I walked in small alleyways, where stories from thousands of years ago were still being told. I walked in large plazas, where the din of Jewish spiritual awakening continues to this day. I gazed with wonder as ancient synagogues rose up again, after being destroyed by the Jordanian occupying forces, who still bleat on about being the custodians of the Old City and protecting its religious institutions. I climbed rooftops and walked upon ancient buildings, taking in the kaleidoscope of colours that greeted me in the most unique view on earth. 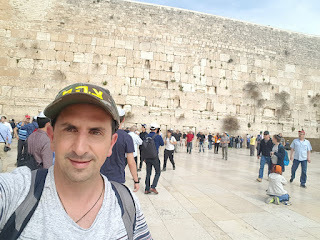 I watched tourists from a thousand places mingle among my fellow Jews, walking in awe, walking in wonder, walking in the footsteps of history in the heart of the Jewish world. How lucky I was to be there in God's own city, and how lucky I was to be in a place that had dominated the dreams and hopes and aspiration of an ancient people - my people. So resolution after resolution may pass, and condemnation after condemnation may pass too. But they are like dust blowing through the winds of time. Long after those who want to rip Jerusalem away from us are gone, she will remain standing, shimmering in the morning sun, glistening in the evening dusk, glowing under the eternal heavens. And we, the Jewish people, will be standing right alongside her.